FAST AND FURIOUS!! SCREAMING COLOUR!! AN EXPLOSION ON CANVAS!! EXCITING!! GUTSY!! ENERGISING!! THEATRE OF THE EYE!! INNOVATIVE!! FRESH!! FANTASTIC!! FUN!! WOW!! Have all been used to describe the works of "Kendall". 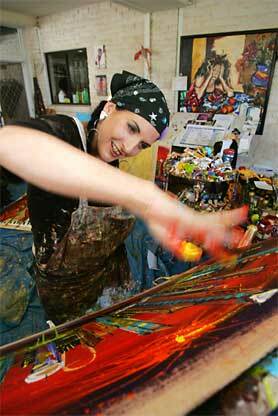 Painting professionally for the past 22 years, Kendall travels the world exhibiting and painting "live on location" for Tourism Australia, the Office of the Australian Consulate General and Department of Foreign Affairs and Austrade. Kendall has previously painted and exhibited in South Korea, Hong Kong, Singapore, Kuala Lumpur, Guangzhou, Toronto, Houston Texas, Christchurch, New Delhi, Mumbai, Bangalore and Shenzhen, China. Kendall entertains guests as she creates one of her masterpieces in a blaze of "colour and character" right before their eyes! But don't stand too close, things can get messy!